Writing Outside Your Culture: Native American or Indian, Ojibwe or Chippewa? When writing outside your race or culture, it is particularly important to avoid labels that unintentionally disparage the race or cultural group. My second middle-grade historical novel, Creating Esther, is about an Ojibwe girl who goes to an Indian boarding school at the end of the 19th Century. My first dilemma was whether to use “Indian” or “Native American.” I didn’t want to offend anyone by using the word “Indian,” but that was what Native Americans were called at the time of my story, and every boarding school had “Indian” in its name. For historical purposes, that was the best choice. But was it acceptable? In September I’ll write about my research trip through Ojibwe country in Michigan, Wisconsin, and Minnesota. For now, it’s enough to say that one of the stops in Minnesota was at the Grand Portage National Monument, where the museum answered my question about using the term “Indian.” I’ll let you read the answer for yourself in the first photo, which I took at the exhibit. My second question was what to call the tribe itself. 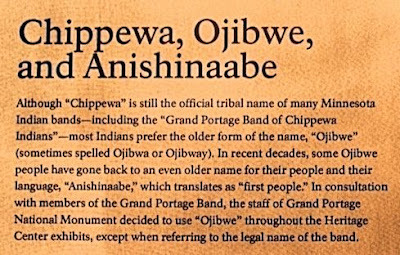 The legal name is Chippewa, and that is the name I was familiar with when growing up in Chippewa County, Michigan. 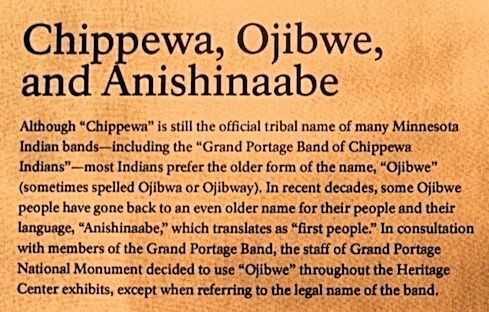 But most tribes call themselves Ojibwe (or Ojibwa or Ojibway). Then there is Anishinaabe, which is the older version. Again, I’ll let the exhibit at Grand Portage provide the answer. When writing historical fiction outside your culture, it is important to balance historical accuracy with sensitivity to the feelings of the culture’s members. Sometimes history has to win out, but think carefully about your choice. And sometimes it’s as easy as asking. Kathryn Page Camp is a licensed attorney and full-time writer. Writers in Wonderland: Keeping Your Words Legal was a Kirkus’ Indie Books of the Month Selection for April 2014. The second edition of Kathryn’s first book, In God We Trust: How the Supreme Court’s First Amendment Decisions Affect Organized Religion, was released on September 30, 2015. Desert Jewels is searching for a home, and Creating Esther has just begun circulating to publishers. You can learn more about Kathryn at www.kathrynpagecamp.com. If you have been around the writing community for any length of time, all published and unpublished writers referenced James Scott Bells’s widely popular craft book, Plot and Structure. Although I haven’t completed the whole book, I have gotten through about 2/3s of it; it does contain a lot of helpful information. Plot and Structure uses tons of examples from many different contemporary pieces to draw the writer in. Bell will explain an idea to you like using Raw Emotion to start the novel, but then he will show you an example of raw emotion from The Quiet Game by Greg Iles. Even though I haven’t read the book or even heard of the author, it doesn’t stop me from understanding Bell’s example. Another great part of the book is the number of exercises that Bell includes in the book. It isn’t about you, as the reader, just skimming through the book, gaining insight. You actually get to jump right in alongside Bell and practice your own hand at improving your writing. If you forget how to do something that he asks you to do in the exercises, then just flip right back to the place in the book and review how he explained it. Toward the end of the book, Bell also shows how to revise and polish your book. If that isn’t enough, then he has written another book entitled Revision and Self-Editing to focus on more ways to make the book even better. I know this isn’t a long post, but this book does have a number of highlights and notes in the margin for me. I’m still working on studying it and trying to pull all the help I can get from the pages. If you have read Plot and Structure, what is the item that has stood out for you? Past perfect tense comes in handy in a "telling" flashback, a character's thoughts or dialogue about a past event, or when you want to ensure your reader knows an action took place before another action (“He had taken his meds before bedtime”). But knowing when to halt using past perfect tense can get, well, tense, and overusing it is an issue I sometimes see when editing, or even reading, novels. Not only is that a mouthful, but that second "had" makes for awkward, right? 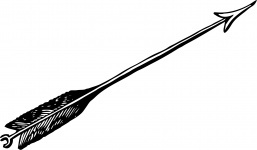 Trust me, these read better: “I had loved him from the first time we kissed” and “The arrow had nearly found its target but bounced off a wall.” Finishing with simple past tense makes for an easier read, and not only in the same sentence, but as the passage continues. These examples might seem extreme, but not only have I seen writing like this (unfortunately in published works), but I know how easy it is for a writer “in the zone” to get wordy and glide over best tense construction. We all do it! So when editing your own work, looking for too much perfect in your past tense is a good idea, kisses and arrows aside. Your editors and readers will thank you for your diligence! Jean Kavich Bloom is a freelance editor and writer (Bloom in Words Editorial Services). Her personal blog is Bloom in Words too, where she sometimes posts articles about the writing life. She is also one of many contributors to a new blog for women, The Glorious Table. Her published books are Bible Promises for God's Precious Princess and Bible Promises for God's Treasured Boy. She and her husband, Cal, have three children and five grandchildren.